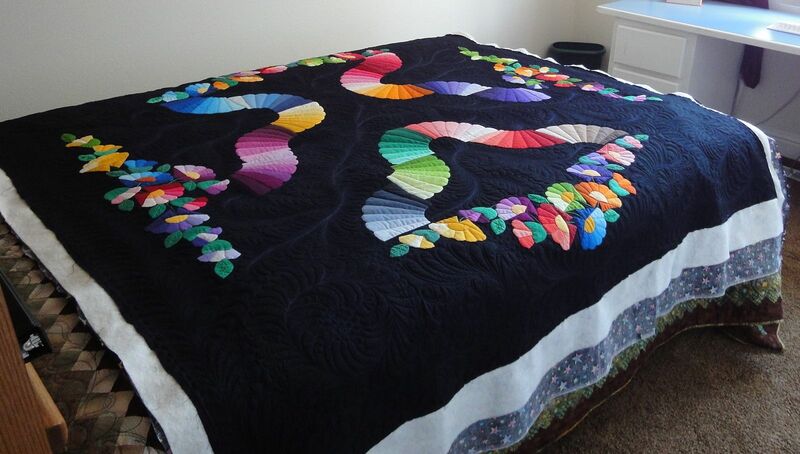 I heard that the client loved the quilt. 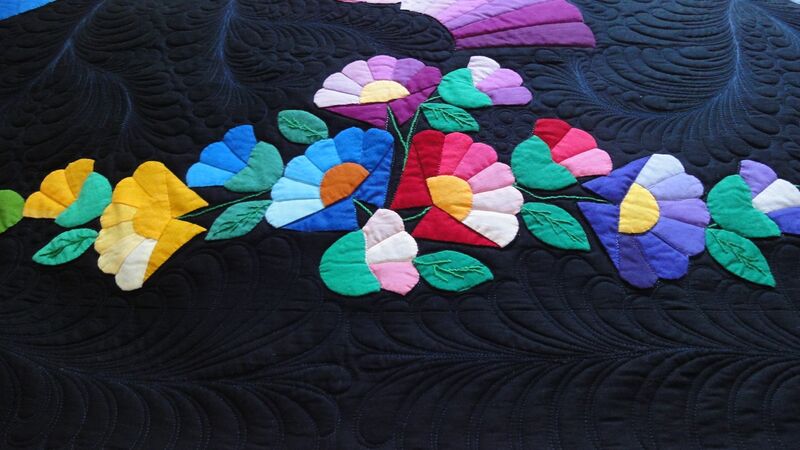 I never actually met her, only know her through this vibrant quilt. This little table is by our front door. 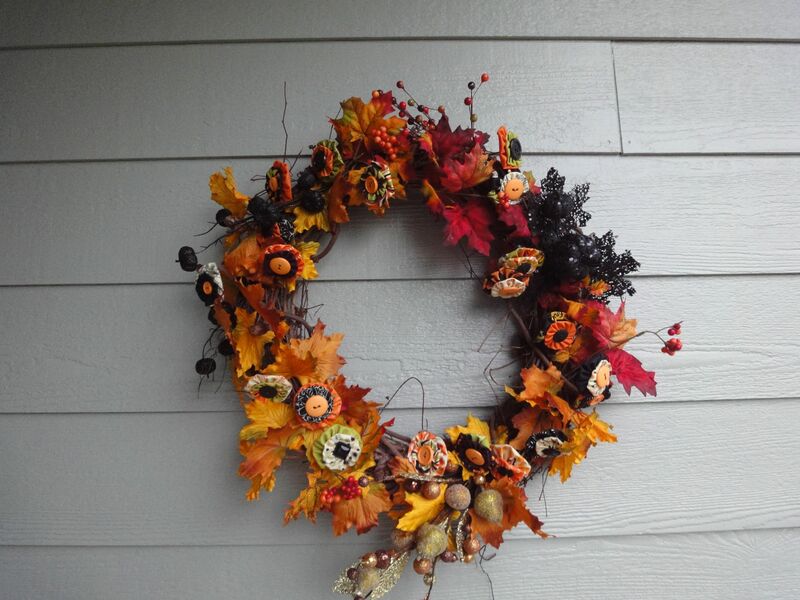 I didn’t actually make the gourds…they came from our neighbor! 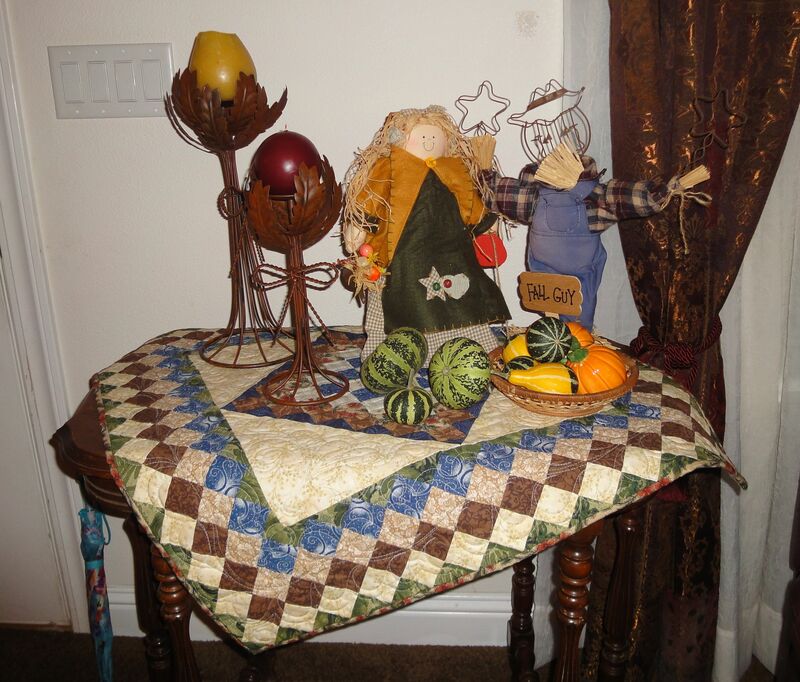 I did make these pumpkins, from a kit I bought at the Emerald Valley Quilt Show in September. 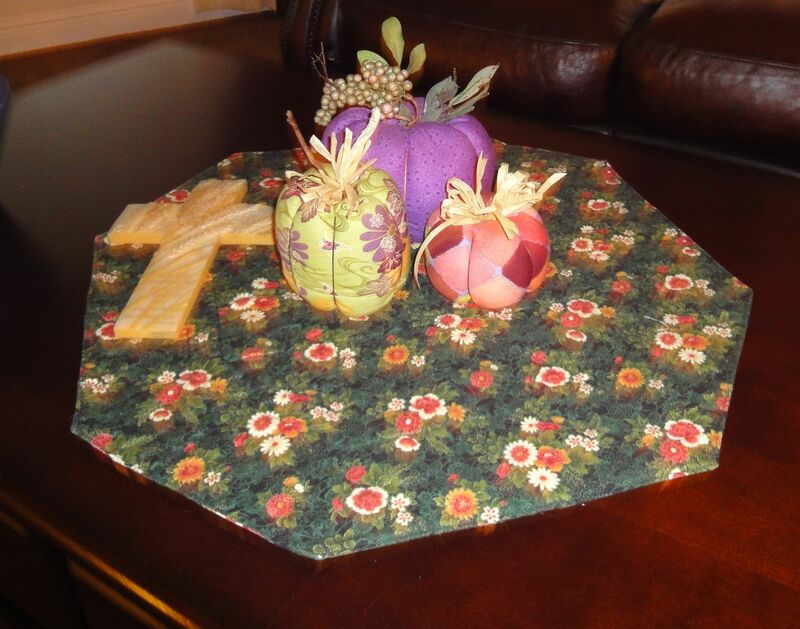 I’ve made a few more sets from the pattern, but gave them all away! This is in on our coffee table in the living room. I know it’s election day! Maybe this will distract you for a few moments. 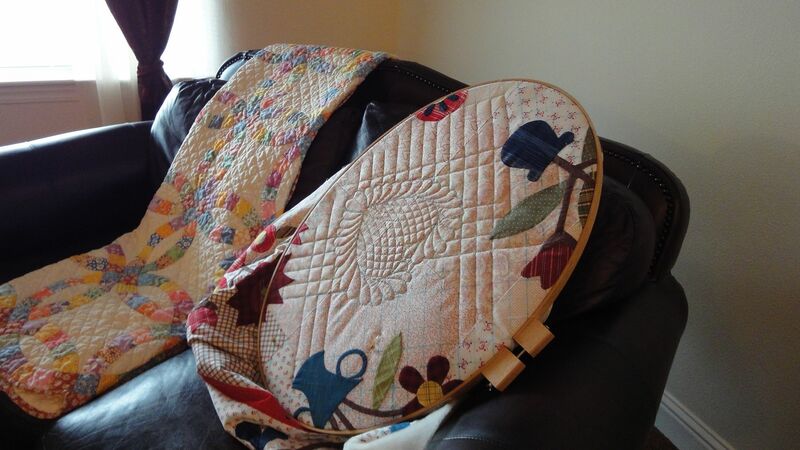 I have been working a lot, getting caught up with client quilts, and here are some pics of them! 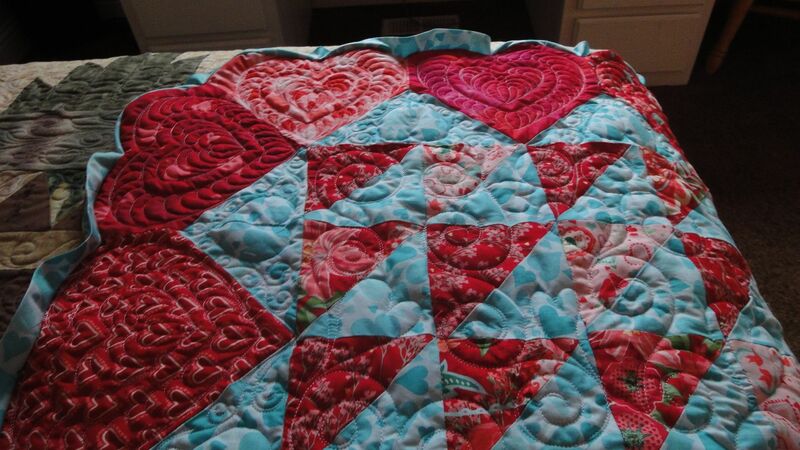 First is Phoebe’s quilt. 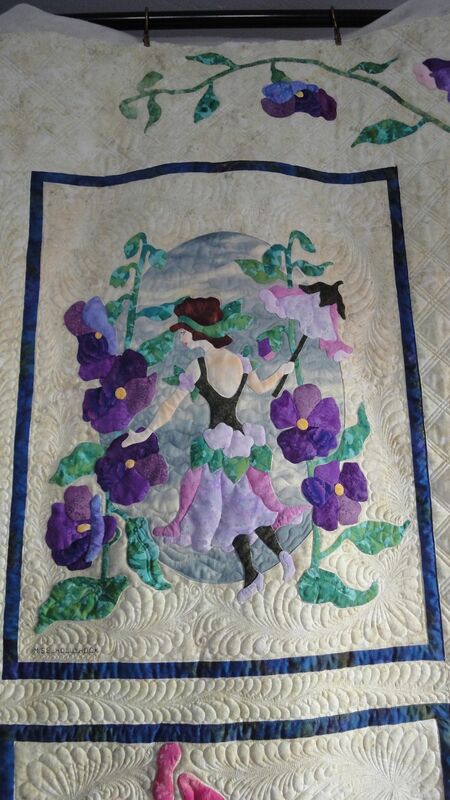 Phoebe is the granddaughter of a friend of mine, and this is her first completed quilt project. 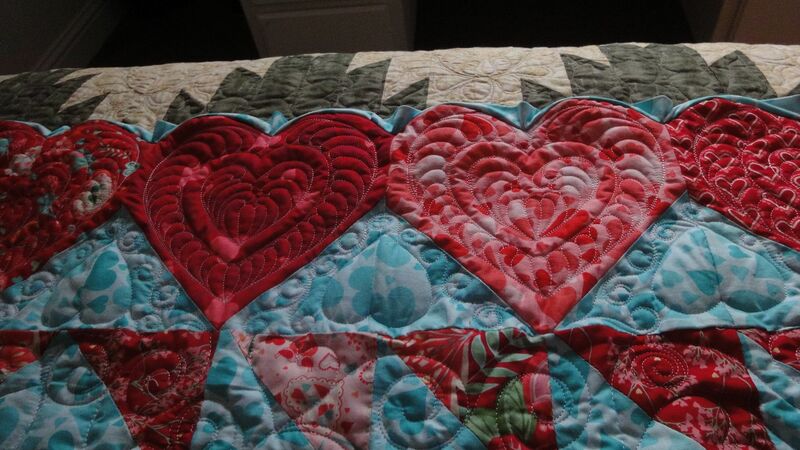 The instructions I received were to quilt it just like the magazine, and I sort of did. I just added a few flourishes. Really. 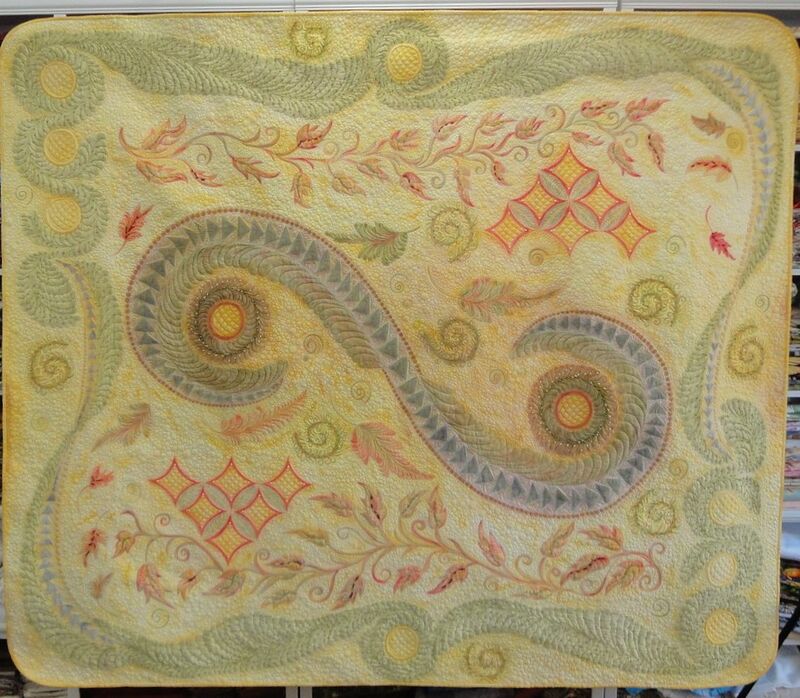 I did get a chance to see this quilt after the binding was sewed down, and it is truly beautiful. 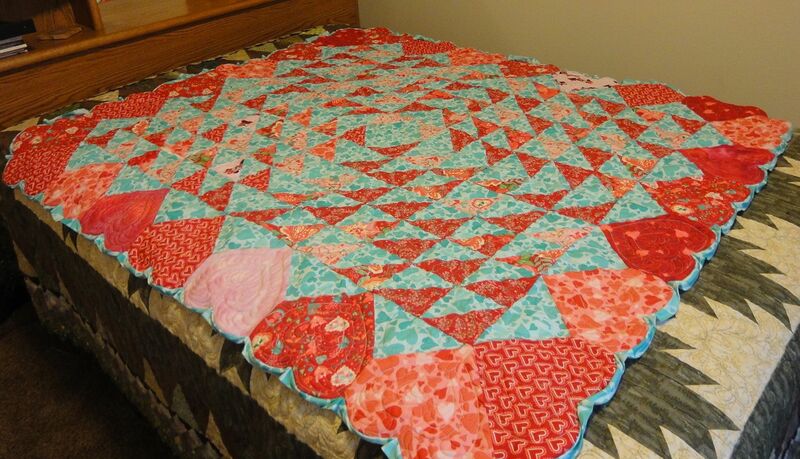 Phoebe will be able to enjoy this quilt for many years, and I’m super happy to have been a part of it. 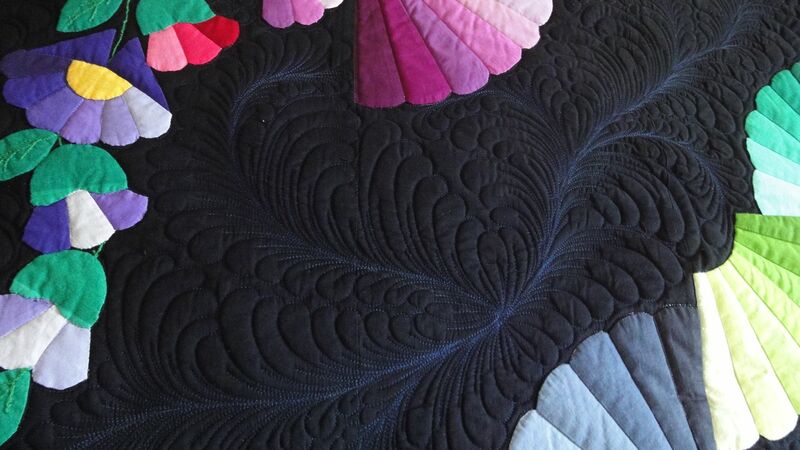 A quilt like this is tricky to quilt. 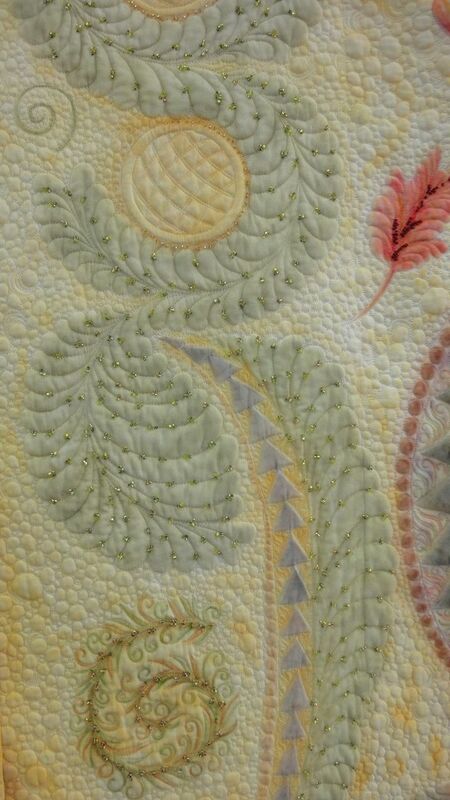 There is so much beautiful space for quilting design, and yet you don’t want to take attention away from the appliqué. I love each of these girls! I love this kick. And look at the beautifully done legs and feet! 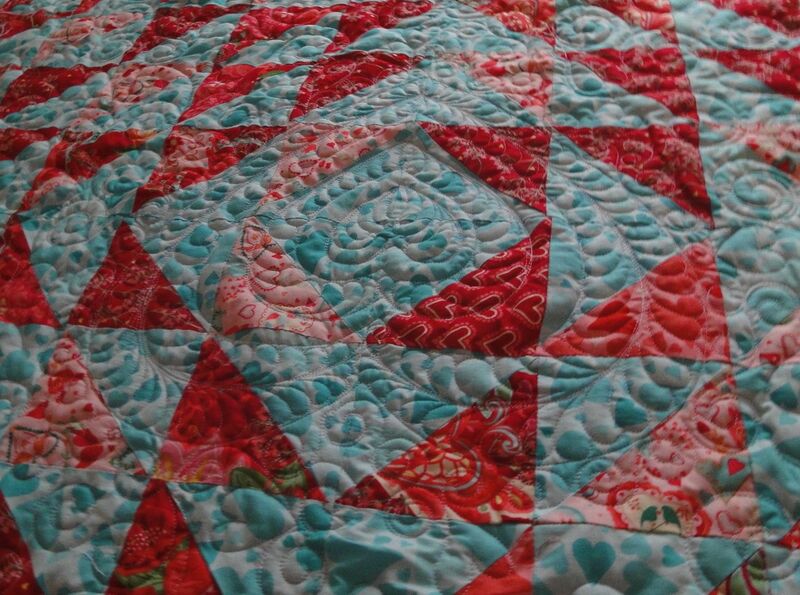 So I think this quilt is another winner from Deanna. 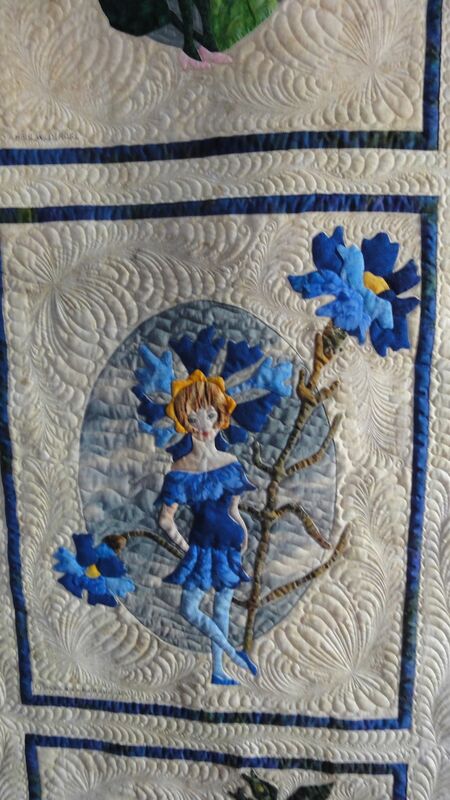 Thanks to her I got to work on this gorgeous quilt, and I didn’t have to do the applique myself!! 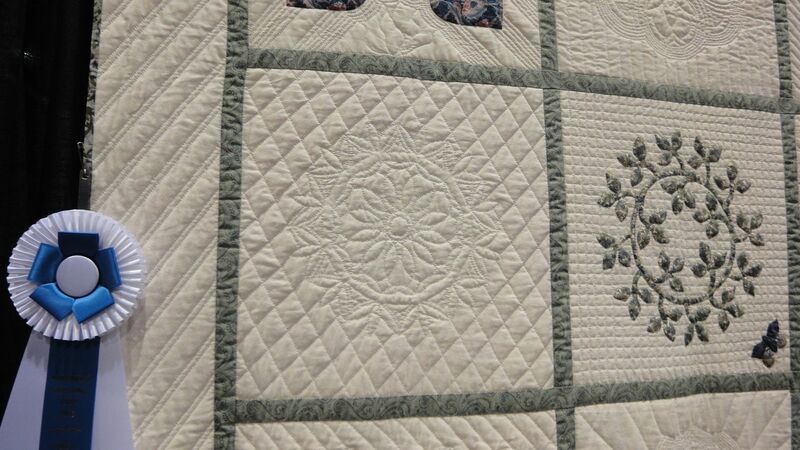 I have been working steadily the last month on client quilts and am almost caught up with my queue. 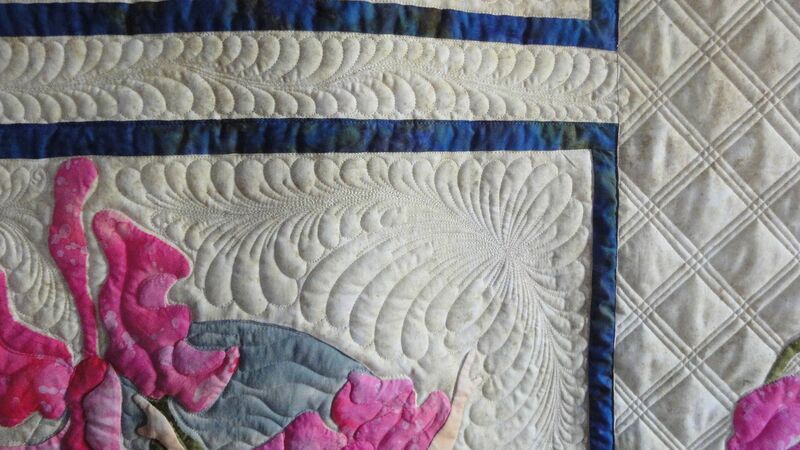 There were also a few quilt shows to attend in September and October, and I have a report for you on Autumn Pathway’s journey. 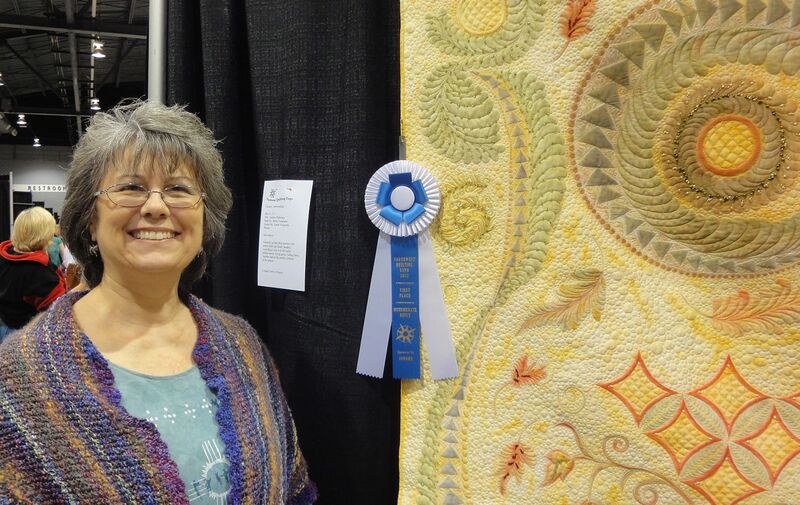 At Northwest Quilt Exposition it won FIRST PLACE in its category. I was pretty excited, even though I already knew I had won a prize. I had been called by the NW Expo staff to invite me to the award ceremony. As well as a ribbon, I came home with $500!!!!! 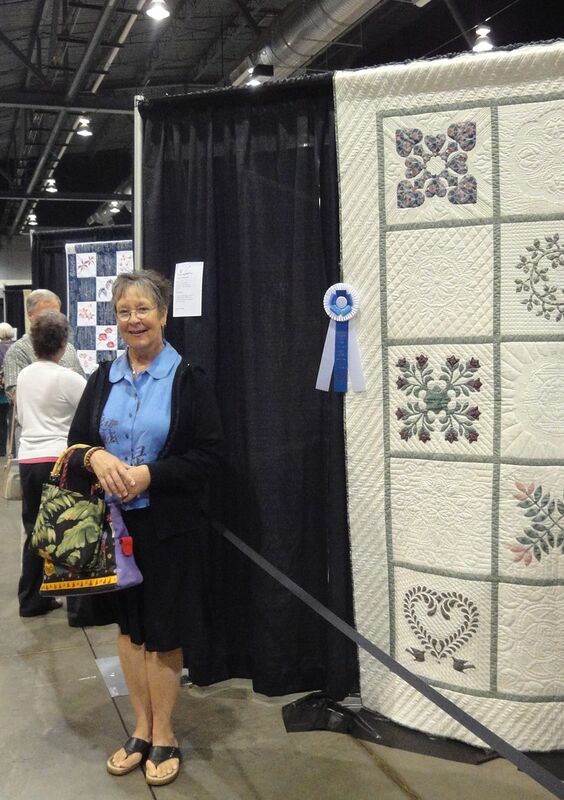 To make the day even sweeter, my friend Jenny also won a first place ribbon for her hand quilted piece! 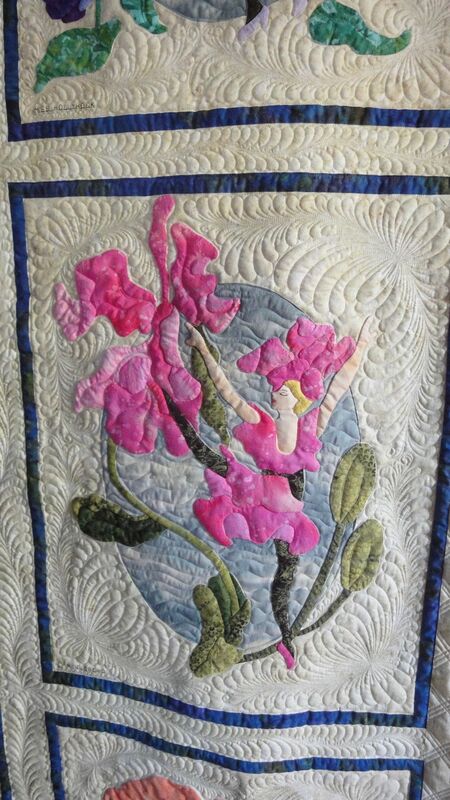 This quilt is truly wonderful! And here is a photo of Jenny, she’s also pretty happy! 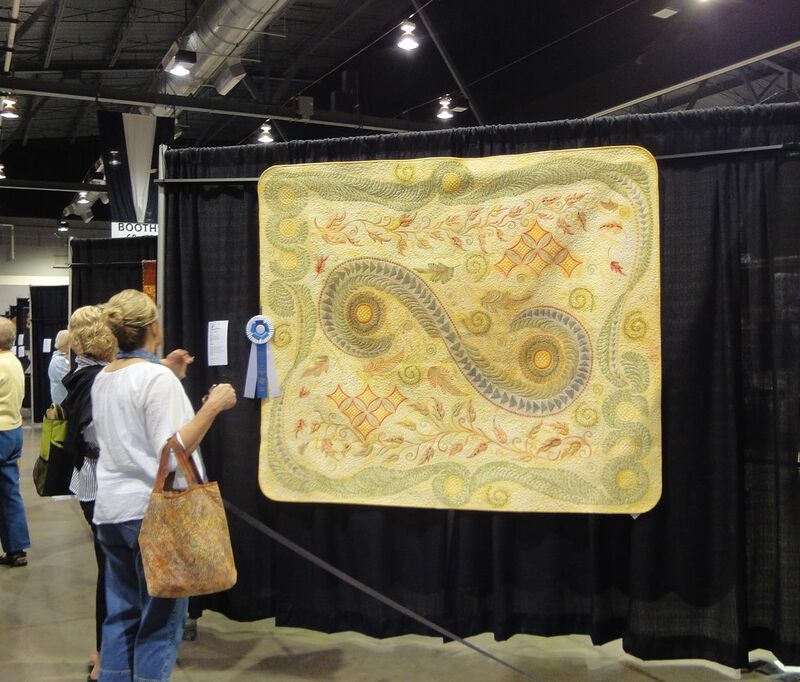 The next show was the Emerald Valley Quilt Show at the end of September, and I am so happy to report that Autumn Pathways was selected as Viewer’s Choice for both days of the show. I received two beautiful handmade ribbons (made by my friend Sheila for the guild) and a large bag of prizes! I was thrilled!!! Autumn Pathways then traveled back to Portland for the Machine Quilters Exposition. It did not place in that show, but I did get some very good marks from the judges and I appreciated the information on the judging sheet. The next show is “Road to California,” in January. I will hear by December 1st if it is accepted into that show. 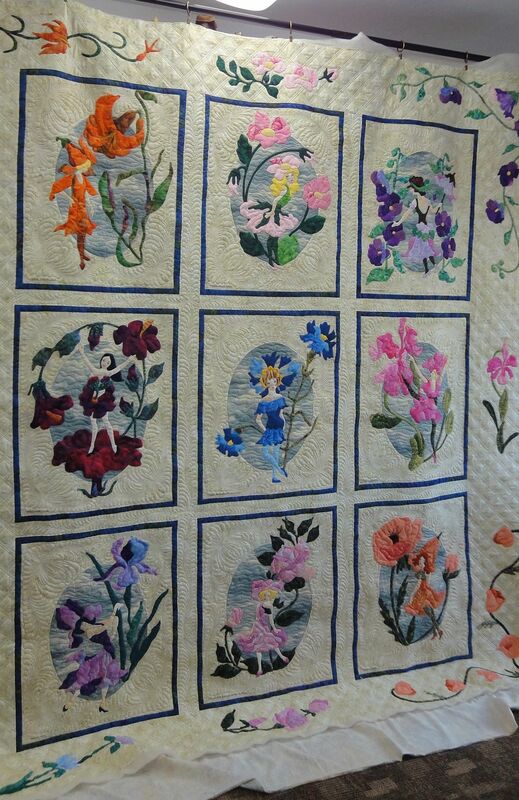 In the meantime, I am thinking about and working on designs for a show quilt for next year! 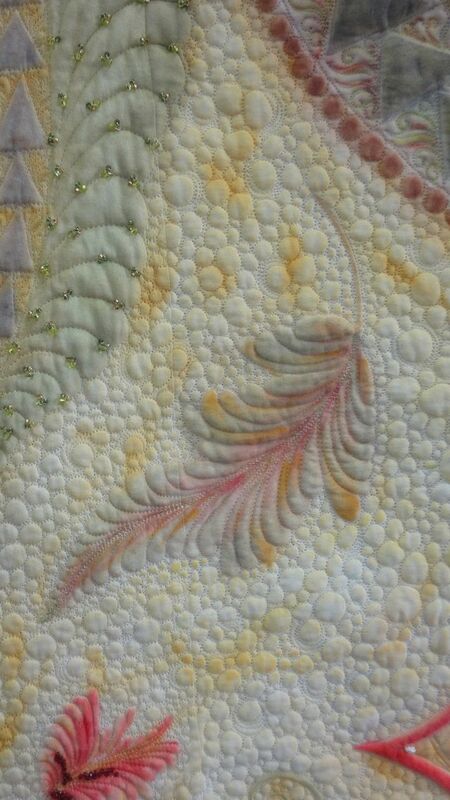 Autumn Pathways is completely finished and on its way to its debut show, the Northwest Quilting Expo in Portland, Oregon, September 20-22, 2012!I took this photo in my studio just after I finished over 40 hours of beading. 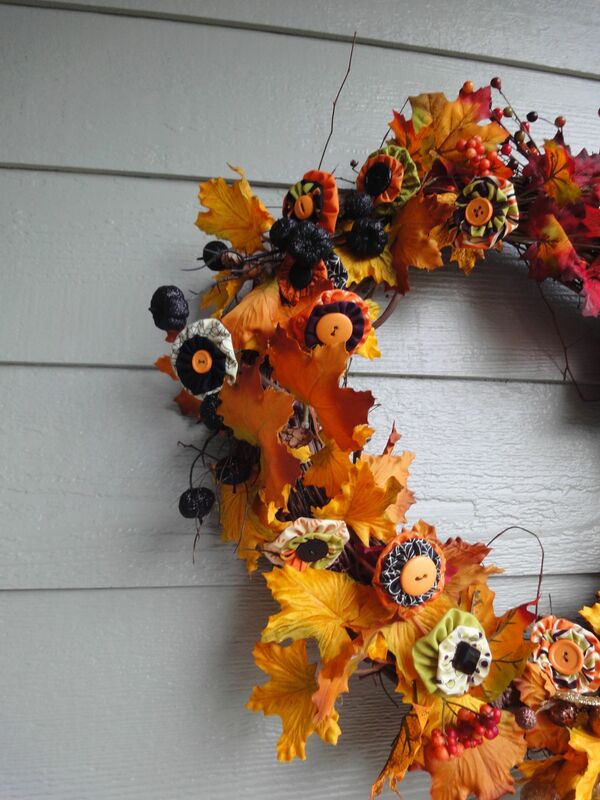 This is my favorite of the falling leaves. The color variations look just as I wanted them! I’m estimating the total number of time spent on this project at around 300 hours. It is easily the most intense piece I’ve ever worked on, and I’m very pleased with the results. 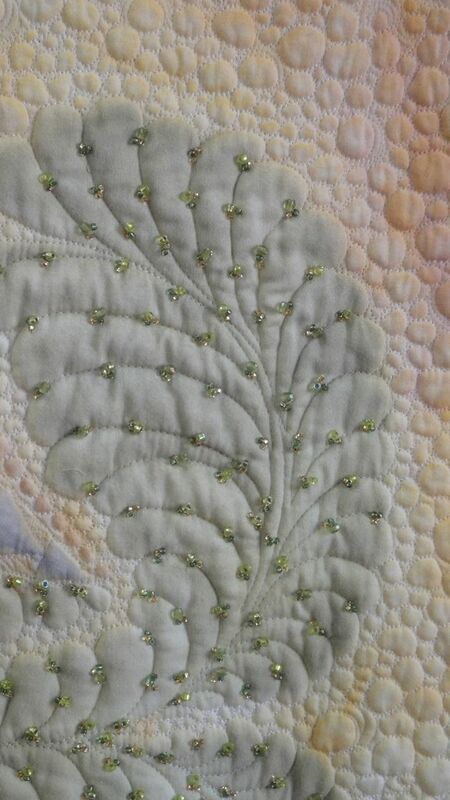 After Northwest Quilting Expo, Autumn Pathways will be shown at the Emerald Valley Quilters show, “Legacies In Thread,” September 29-30, and then MQX West (Machine Quilters Exposition), also in Portland, October 17-20, 2012. I’ll let you know what happens in those events. 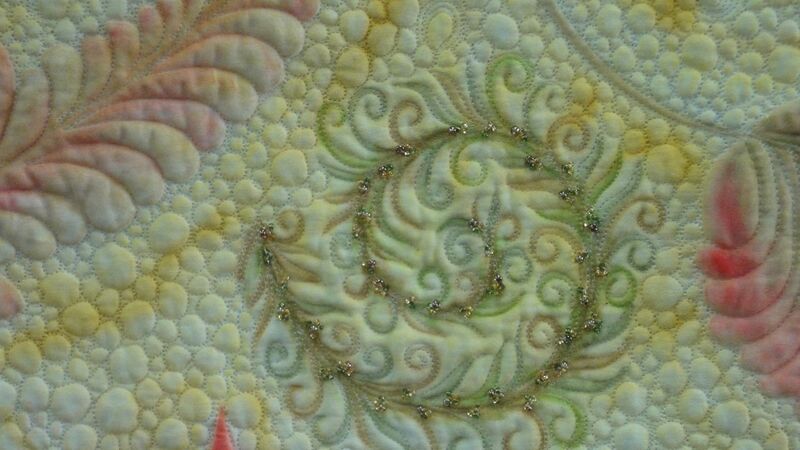 IN THE MEANTIME, I am working on another piece that will be submitted for the Small Quilt Auction at the Legacies in Thread show. The auction will be Saturday, September 29, at 1:00 pm. If you’re local to the Eugene, Oregon area, come see what our members have to offer. There are always wonderful pieces to purchase! A couple weeks ago Dave from Boersma’s installed these new wheels on my Gammill frame. 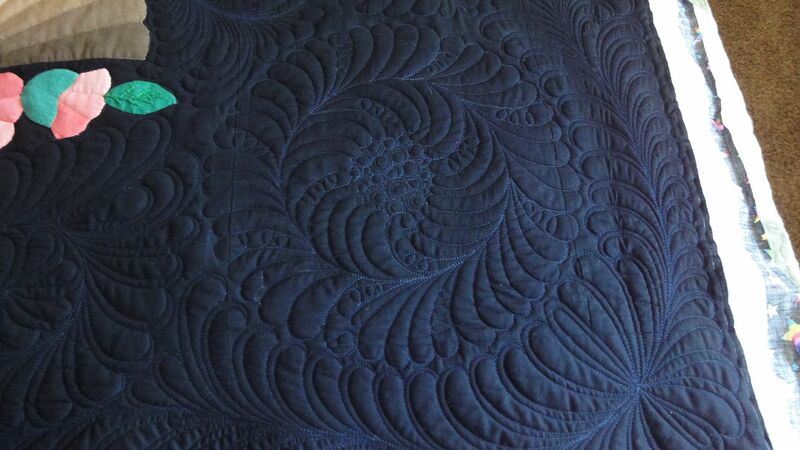 What a huge difference this made during the next 35 hours of work creating the fill on my show quilt! I hadn’t realized the physical effort involved in pushing my machine around. 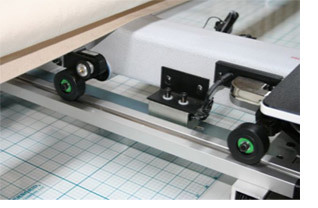 The ease of moving the quilting machine easily doubled the amount of time I could spend quilting during one session. 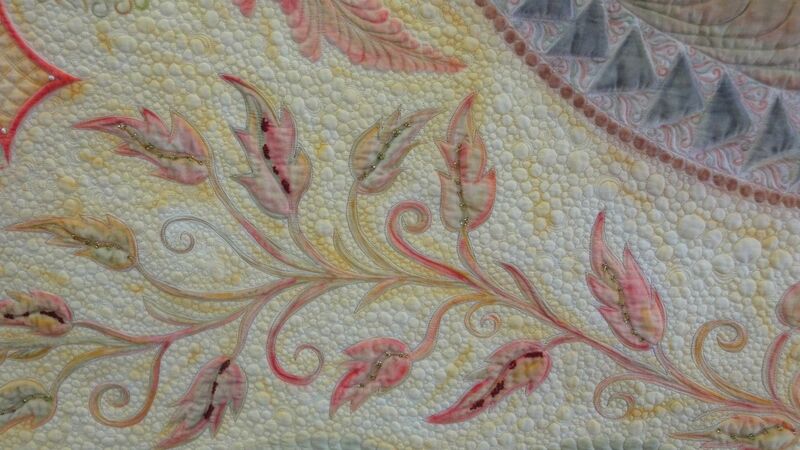 Pioneer Quilters Boutique is Amazing! 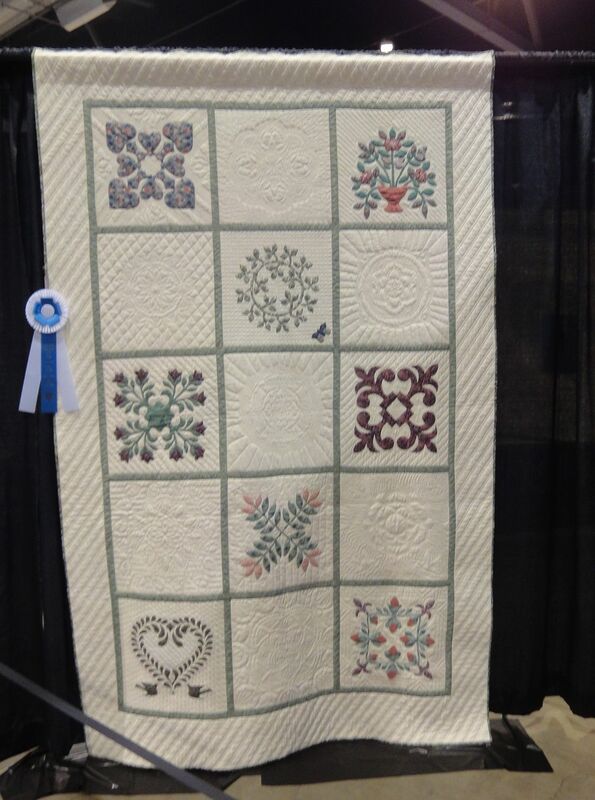 “Our Quilting Family” a Stunning Success! Jessica Beaudet is the Star of the Day!